I have to admit you can’t complain that there isn’t enough choice of flavour in the UK crisp market. WE really are very lucky to have the selection that we do, with new varieties arriving regularly. 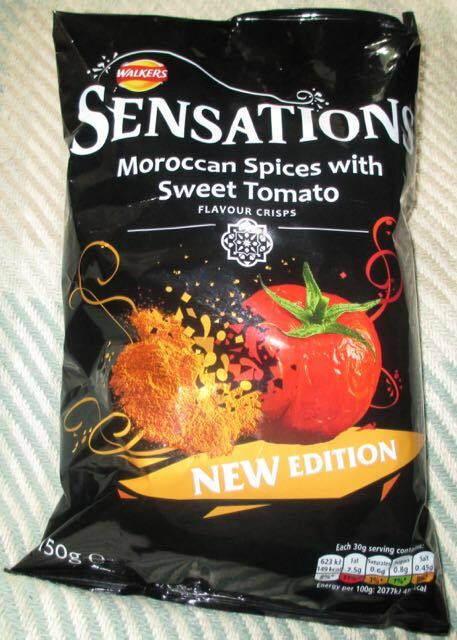 One of the latest flavours from Walkers joining the Sensations range are their Moroccan Spices With Sweet Tomato flavour crisps. This variety is a new addition to the Walkers Sensations range, and is available in a 150g sharing bag. The crisps are the usual texture you would expect in the Sensations range, firmer than regular Walkers as they are slightly thicker cut, but not hard and sharp like some gourmet crisps. I as a bit surprised that the ingredients list on the back of the bag wasn’t very specific, “Moroccan Spices with Sweet Tomato Seasoning” so I guess I’d have to let my taste buds decipher them. The flavour is pleasant, there isn’t too much heat. The chilli nature of them is mild, with just a gentle warmth, nothing that is going to put people off or require ice water! The spices also add a nice background taste, I can pick up on paprika and a hint of cinnamon which is nice paired with the savoury tastes. The sweet tomato does shine through well too, with it lingering in the background. They do fell very summery, and would be nice on hot day with a barbecue, if the British summer ever kicks in.